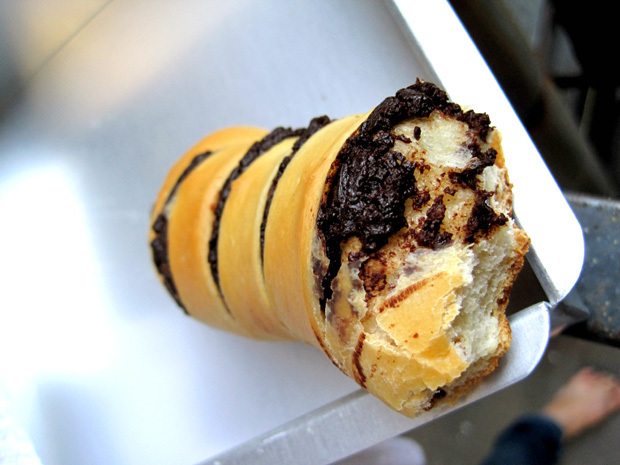 These chocolate buns look like little caterpillars, don’t they? My bread kneading skills have improved after several failed attempts, and I think I’ve figured out how to achieve a pretty soft and fluffy texture. However, my shaping skills are still not quite there yet. I still have a long way to go before I can create good looking food. At least I can take heart in the fact that they taste good. As you can see, I experimented with a few different shapes. I wasn’t really sure what I was doing but I figured it’d be edible anyway. The recipe for the bread is one that I’ve used several times now, and it has always worked for me. I think it’s an incredibly versatile one that can be used for both savory and sweet fillings – the last time I used it was for my hot dog buns. The chocolate filling I actually made for this batch is actually a departure from the recipe I based it off on. I used all purpose flour instead of cake flour, and replaced the cocoa powder and butter with unsweetened chocolate. I intended on subbing it with an equal amount of unsweetened chocolate, i.e. 28g of unsweetened chocolate for 18g of cocoa powder + 10g of butter but I totally had a brain fart and added in 80g of unsweetened chocolate instead. The texture was fine, but as I tasted it, I grimaced at how bitter it was and added more sugar to it. Unfortunately, I didn’t measure how much I added in – so I recommend just following the recipe I posted below. Mix bread flour and water in a saucepan; continually stir over medium-low heat until your whisk/spoon leaves trails in the mixture. Take off heat and let cool. Combine all dry ingredients: flour, salt, sugar and instant yeast in a bowl. Make a well in the center. Whisk and combine all wet ingredients: milk, egg and tang zhong, then add into the well of the dry ingredients. Knead until you get a dough shape and gluten has developed, then knead in the butter. Mind you, it’d be quite messy at this stage. Keep kneading until the dough is smooth, not sticky and elastic. (Tip: you might like to test if the dough is ready. Stretch the dough with two hands. If it forms a thin “membrane” that’s very elastic in texture. Use a finger to poke a hole. If the hole is a circle, not an irregular tear-off. That means you have successfully kneaded the dough to a perfect stage. Yet, don’t over-knead the dough. Otherwise all the tissues inside would be broken apart.) The time of kneading all depends on how hard and fast you knead. While waiting for dough to rise, make chocolate paste. Mix sugar and cake flour into the egg white until smooth. Place milk in a saucepan and heat till just simmering. Add coca powder into the milk and stir till cocoa powder is incorporated into milk. Add egg white mixture into the cocoa mixture and stir over low fire till mixture thickens. Add in butter and stir till incorporated. 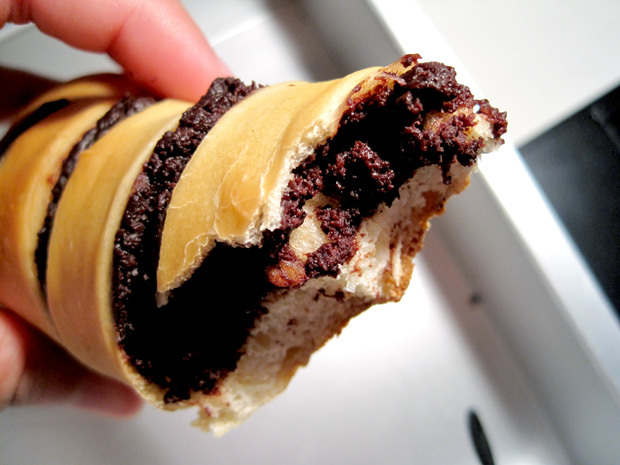 Leave chocolate paste to cool. Keep refrigerated before use. Once dough has doubled in size, transfer to a clean floured surface. 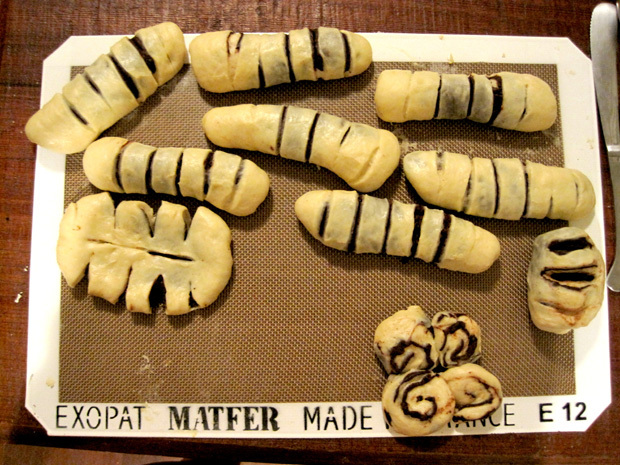 Deflate and divide the dough into ten equal portions. Knead into ball shapes. Cover with cling wrap, let rest for 15 minutes. 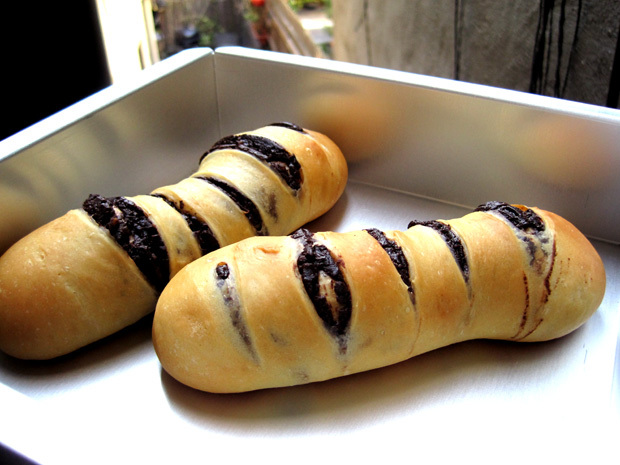 Knead each portion into a flat circular shape and place about two tablespoons of chocolate filling inside. Place rolls on a tray lined with baking paper, covered with cling wrap or a wet towel. Leave it for the 2nd round of proofing, about 45 to 60 minutes, until double in size. Brush whisked egg on surface of rolls. (I omitted this) Bake in a pre-heated 180C (356F) oven for 30 minutes, or until golden brown. Transfer onto a wire rack and let cool completely.